Earlier this week I told you about a project that I’ve been plotting and working on. This weekend I finally got the dear husband and my niece to help me move the tub to the back porch so it would be protected from the dogs, cows, and chickens. 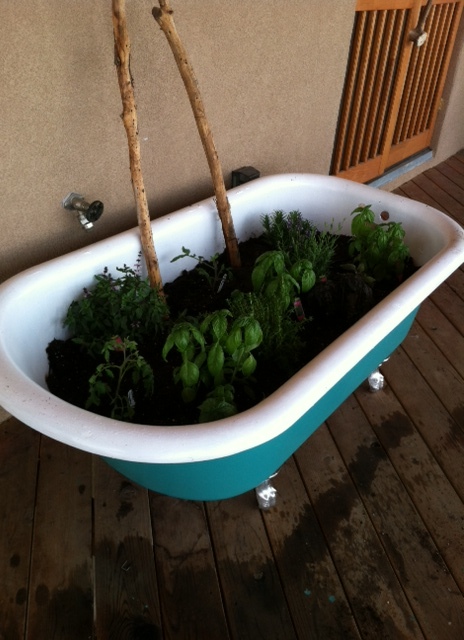 A little paint and potting soil and we’ve got herbs in the bathtub! Here’s what I started with. 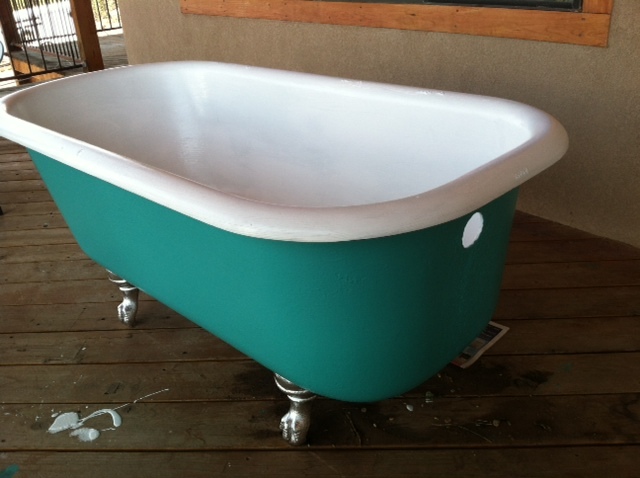 I bought this tub 10 years ago from the first school I worked at! It had been sitting in the library and one summer they decided to clean out the school and wanted to get rid of it! It was in remarkable shape really and I had grand plans to have redone and put in my house. 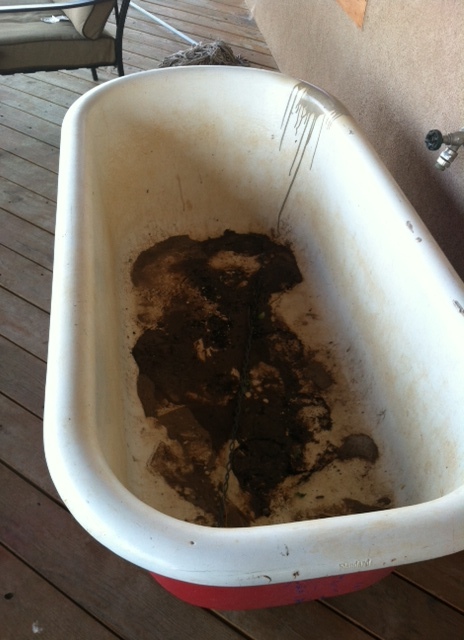 The house got built and there was no money to do the bathtub so it has been sitting on the porch. I tried to plant strawberries in it once but the dogs kept laying on them. Then my little angel boy got ahold of a can of spray paint about a month ago and gave it a little touch up. It was time to do something with the tub! I had some turquoise paint left over from my kitchen so I used it to spruce up the outside! Love turquoise! I repainted the inside to keep the soil from corroding the enamel any further just in case I ever get a wild hair and decide to bring it inside. A quick blast of silver metallic paint on the feet and DAMN! I think it looks good! 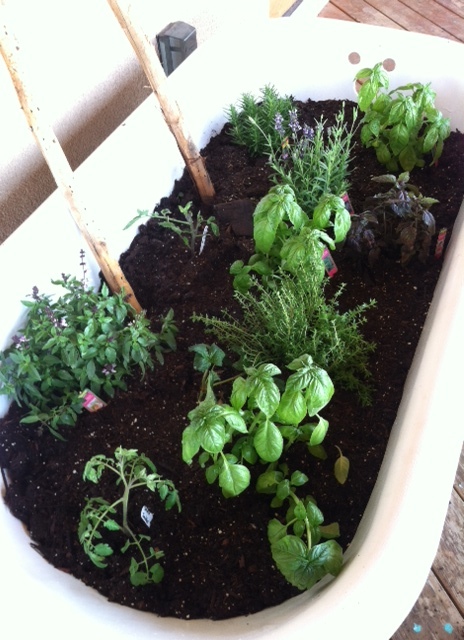 I filled the tub with soil and stuck in some herbs and tomatoes! I had originally planned to plant these on the hillside I’m trying to turn into a garden but this summer the sun has just been too intense! Everything I’ve planted there has fried! So here is Plan B. 🙂 The final result! Complete with a couple of posts for the tomato to climb! THAT is cool. 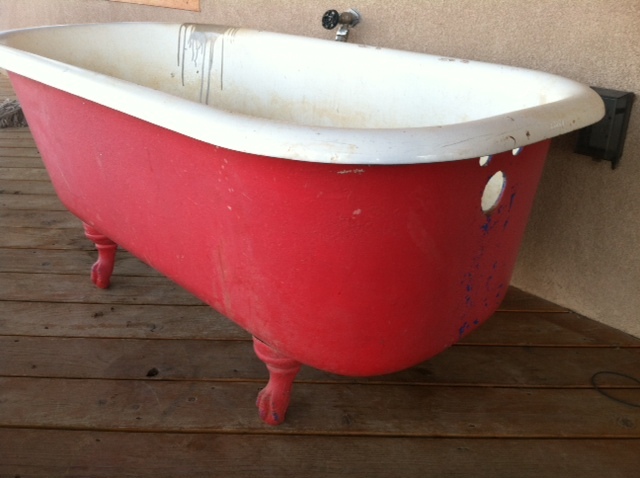 Now I’m looking around for old bathtubs.